WASHINGTON — An upcoming report from the Justice Department’s internal watchdog is expected to criticize senior FBI leaders for not moving quickly enough to review a trove of Hillary Clinton emails discovered late in the 2016 campaign, according to people familiar with findings. The FBI’s timing has been a sore point for Clinton supporters, who say then-director James Comey’s announcement of the review less than two weeks before the Nov. 8, 2016, election contributed to her loss. The agency’s findings affirming their decision not to pursue criminal charges against Clinton were disclosed two days before the vote — too late, her supporters say, to undo the damage. Some FBI officials knew in September 2016 of the emails on former Rep. Anthony Weiner’s laptop but the bureau did not obtain a warrant to review them until the following month. Clinton supporters say the candidate’s name could have been cleared much faster if the FBI acted on the emails as soon as they knew about them. The report will likely revive scrutiny of the FBI’s handling of the Clinton case and the extent to which it helped shape the outcome of the presidential election. Its conclusions may cut against President Donald Trump’s repeated assertions that the FBI was working against him during the campaign and instead revive allegations that the bureau broke from protocol in ways that ultimately harmed Clinton. The nonpolitical watchdog has been repeatedly pulled into the partisan arena, amid demands to investigate Justice Department actions in the early stages of the FBI’s probe of possible coordination between Russia and the Trump campaign. On Sunday, the Justice Department asked the inspector general, Michael Horowitz, to expand his existing investigation to look into whether Trump associates were improperly monitored during the campaign for political reasons. The report dealing with the Clinton emails arises from a wide-ranging investigation launched in January 2017. 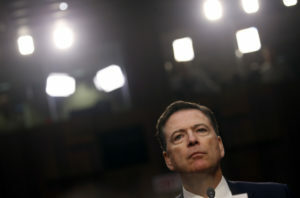 It has been examining actions including Comey’s decision to announce his recommendation against criminal charges at an FBI headquarters news conference and his decision months later to alert Congress that the probe had been reopened because of the discovery of email messages on Weiner’s laptop. A separate inspector general report from last month faulted former Deputy Director Andrew McCabe for misleading investigators about his role in a 2016 news media disclosure about an investigation into the Clinton Foundation. McCabe, who has denied wrongdoing, was fired because of those findings, and the inspector general has referred the matter to the U.S. Attorney’s office in Washington for possible criminal prosecution. Comey said it wasn’t until the morning of Oct. 27 when FBI officials asked his permission to seek a warrant for the Clinton emails, having determined that “hundreds of thousands of emails” from Clinton’s personal email domain existed on the computer and that there was no way Weiner would consent to a search of his entire laptop given the legal trouble he was in.